Looking better and better as the season progresses, the Plainville High football team is in position to clinch its first winning season in four years tonight when it hosts an Avon team that has also been surging in recent weeks. Avon had gone 0-6 - including being shut out in four straight games - before picking up a 20-0 victory over hapless Bulkeley/HMTCA/Weaver two weeks ago and a much more impressive 35-8 win over Rocky Hill last week. Plainville coach Tim Shea said he’s seen Avon play the last couple of weeks. This past Saturday, Avon senior Jadon Folkwein ran for 203 yards and three touchdowns, so he’ll be a player the Blue Devils will have to keep an eye on. Dan Quick added 73 rushing yards and one touchdown to Avon’s offense. Avon’s passing game, meanwhile, consisted of three different players going a combined 3-for-4 for 64 yards. “They do some things that pose challenges for us, that we need to be ready to go for,” Shea said. Plainville (5-3) is on a roll of its own, meanwhile, with three straight wins after its bye week, by a combined 99-34 score. 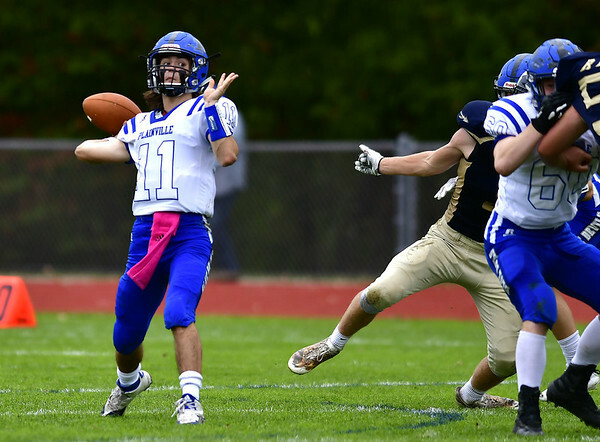 The Blue Devils enter this weekend still mathematically alive in the Class S state playoff race, although they’re ranked 15th and would need a lot to go their way in order to finish among the eight teams to qualify. More realistically, Plainville would like to win tonight, clinch a winning record, and carry momentum into the Thanksgiving Day game against Farmington. The Blue Devils have neither finished above .500 nor won the annual Olde Canal Cup contest since 2014. And, as always, Plainville is looking to get better each game. “There’s always room for improvement,” Shea said. Still, Shea said, the team needs to eliminate “dumb” penalties, such as personal fouls, which have continued to be a problem. “It burns you, puts [the opponent] in better situations, takes us out of situations,” he said. Plainville’s offense has been very effective in recent weeks, and will look to spread the field against Avon. Tonight’s game will also be Senior Night for the Blue Devils. Posted in New Britain Herald, Plainville on Thursday, 8 November 2018 15:39. Updated: Thursday, 8 November 2018 15:43.